They're from Nashville, but don't hold it against Blackwater James. This is far from country music and its Mecca. Think 80's rock with a gritty hard riffs, an interstate highway pace, and lightning guitar licks with good melodies and infectious choruses playing over a barroom brawl. This ain't your latte swilling vegan alt rock or navel gazing, my-daddy-never-loved-me, post grunge blather. If you were wondering about the state of American hard rock, then Blackwater James tells you it's good; good like Blackstone Cherry, Buckcherry, Staedlur, or Silvertide. 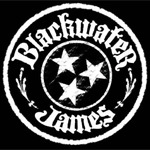 The 'James' in Blackwater James is journeyman guitarist and vocalist Chris James who's done his share of gigs with more than a few obscure bands. Heavily dosed on Metallica, GnR, Pantera, and others as a youngster, this heavier grittier edge shows in Blackwater James' debut. Throughout this work, there is raw enthusiasm and energy built upon strong riffs and brisk pacing. Surprisingly ambitious and generous fret work cranks up this energy like adding extra hot sauce to an already fire-breathing chili. Midnight Train, Roses & Rain, Sick Generation are just a few songs that will send smoke billowing from your iPod. If you hear Blackwater James play live, then it better be in a well ventilated room with an ice cold beer. If there is anything near to a Southern motif here, it's the well developed vein of blues which invigorates many songs including Taste, the bluesy rocker All Fired Up, the anthems Stand Up and Wake Me (slight touch of Slash in the guitar work there), and the magnificent 8 Letters Gone. Throughout, the guitar work blisters and thrills. With this said, Blackwater James might be best described as hard guitar rock, thanks to the song composition and guitar skills of Chris James, on the more aggressive solos, and Deanna Passarella, on the smoother solos. Blackwater James is straight up, invigorating, American hard rock with an honest rowdy swagger that comes only from sound song development and exceptional musicianship. Great stuff, and highly recommended.